Carp Tennis Club, a volunteer-run tennis club, is a member of the OTA (Ontario Tennis Association) and the NTCA (National Capital Tennis Association) and is in partnership with the City of Ottawa. We offer instruction, tournaments, summer camps, and social events. 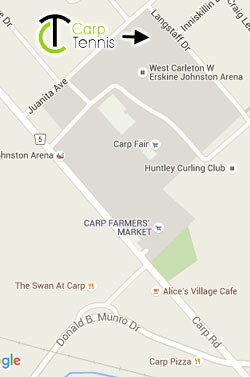 We are located on the Carp Fair grounds at the corner of Langstaff Road and Juanita Road in Carp, Ontario. To promote an active and healthy outdoor lifestyle in a fun environment for adults, kids and the whole family. The booking sheets will be in the cabinet on the courts. Please enter your booking as this is the only way to guarantee your playing time. You may advance book for the week ahead up to 5 daily sessions. Please consult the new instruction board by the booking cabinet. Click here for the schedule for Programs & Lessons at Carp Tennis.